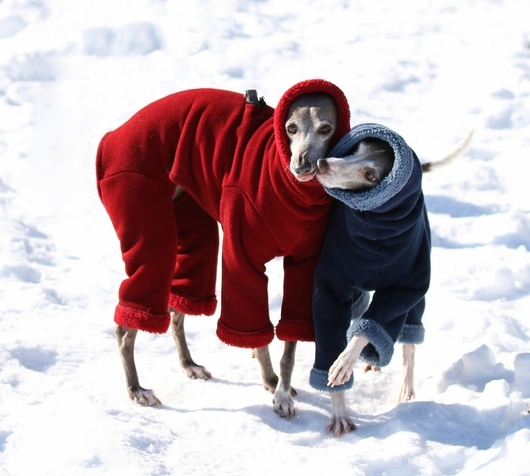 Warm fleece outdoor bodysuits designed specifically for Italian Greyhounds! The form fitting shape covers the belly and the legs down to the ankles to protect your IG from the icy cold, wind and light rain, making it easy to go to the bathroom as well! They have no velcro, zippers or clasps and will stretch so your IG can run! Every suit has a turtleneck and an inconspicuous opening for a harness if one is used. 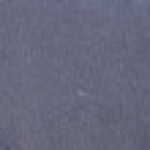 All suits are made in the USA of the warmest fleece and are fully machine washable/dryable. Grand Italian Greyhound bodysuits can be worn alone or under any overcoat or raincoat. This fabric is very toasty and should only be worn outside, your dog may overheat if worn inside. The easiest way to put on a hooded bodysuit is to roll the hood all the way back before pulling over the head. It goes on quickly and smoothly and will not leave your dog in the dark! To help us determine that the size you chose is the correct one, please put your IG's Length and Girth measurements in the "Comments" section of your order form. Size 14: Length 13-14" Girth 15-16.5" Weight 7-10lb Height 14"
Size 16: Length 15-16" Girth 17-18.5" Weight 11-15lb Height 16"
Size 18: Length 17-18" Girth 19-20.5" Weight 16-20lb Height 18"